Nothing says the ’50s like a poodle skirt. Tinsel. Is it retro, passé, or environmentally irresponsible? Don’t ask me. I only know it ain’t what it used to be. But then, what is? As another Christmas eve hurtles closer on a wave of emotional expectations and quiet dread, I am, as usual, engulfed by memories of Christmas Past. I was born on Christmas eve. And, although I have no memories of that event, I do have a visual in my head, thanks to my father, who many times described that night he spent staring out the hospital window at the falling snow, while my mother was busy down the hall, bringing me into the world. This was back when fathers weren’t allowed into delivery rooms, much less permitted to video the entire proceedings. Things were different. Christmas was different. The tinsel we put on our trees was actually made of some sort of metal, though I find it hard to believe it was tin. I do know it would get wrinkled and kinked. Some of us hung it one strand at time, savoring the process. I loved everything about Christmas when I was a young child. I loved going up to my grandparents’ house in Erie. The snows were deeper up there, and more constant. Winter settled in for the season. It didn’t come and go like a fickle boyfriend the way it does in Virginia. The long and perilous drive through the dark tunnels on the Pennsylvania Turnpike lent an aspect of adventure to the trip. And when we got to my grandmother’s house, I got to sleep in a room by myself, while my brothers took over the sleeping porch. In the years since those times my feelings about Christmas have changed, as has the holiday itself. Some people, habitual ranters, complain about this. But it’s not Christmas’s fault. I’m not sure blame can be assigned. Because Christmas, with all its cookies and carols, its ribbons and wrappings, its greed and grace, is just part of the warp and woof of the fabric of time, blended in there with all the other calendar items, spinning round and round life’s crazy carousel. We try to grab the brass ring when we’re young. It’s not brass anymore; carousels have gone plastic like everything else. But we’re still spinning, and the older I get the faster it seems to go. When I was a parent of young children myself, I tried to recreate for them the sense of comfort and mystery and joy that Christmas gave me as a child. Like so many parenting experiences, it made me feel inadequate and helpless. I wanted to give my children a sense of the possibility of miracles in this dark and uncertain life. Yet when I look back on it now, I’m glad I at least tried to keep the spark alive. In ancient times pagans lit bonfires to warm the midwinter nights. We string colored lights on our roofs. Each generation creates its own magic. The longest night of the winter is past, but we have a ways to go before we emerge from the tunnel. Merry Christmas to all and to all a safe journey. Well, if your birthday was published on the Facebook machine, I’d have sent you Birthday Greetings! Huzzah and Carry On! 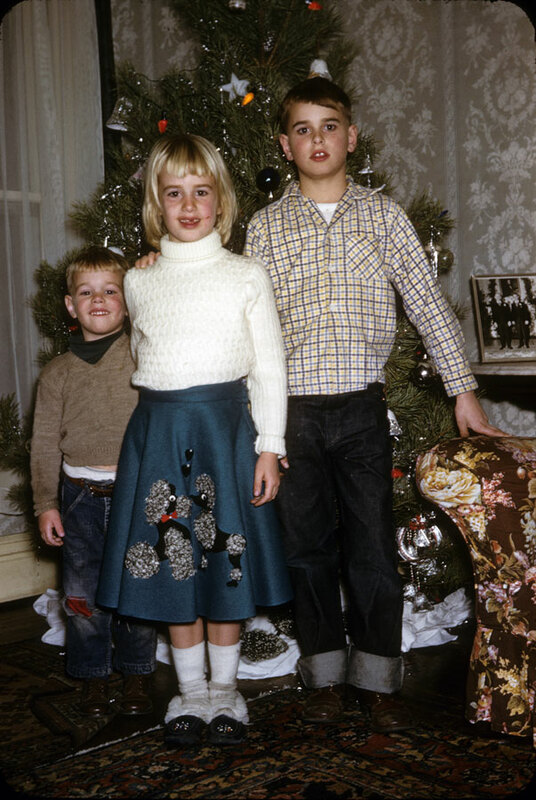 And Merry Christmas – that poodle skirt brought back a million memories. About that tinsel: I recently read that the foldable and often tangled tinsel was made of Lead!!! Thanks so much for getting rid of that stuff! We’re going to the Casino – how about you? On Christmas? Why not, I’d love to go, too. It sounds like more fun than what I planned to do. My plan wasn’t firm, it varies by year. My family’s back East, and my friends are back here. But on Christmas, it’s different, I’m an orphan with no hub. Not a problem to me, I like being alone. I have memories of the past and it’s nice on my own. How I wish I had saved them from our Evil Step-Mother. Oh, but that’s all past, no need to go there. I’ll enjoy this year and gamble without care. I’ll joke with Sue and Mike, then we’ll eat some dinner. With money in our pockets, a whole lot of loot! Christmas at the Casino, it’s odd but it’s Fun. We’ll say Merry Christmas to Every One!